Were Hedge Funds Right About Buying Rio Tinto Group (RIO)? Is Rio Tinto Group (NYSE:RIO) a healthy stock for your portfolio? The best stock pickers are getting more bullish. The number of long hedge fund positions rose by 3 lately. 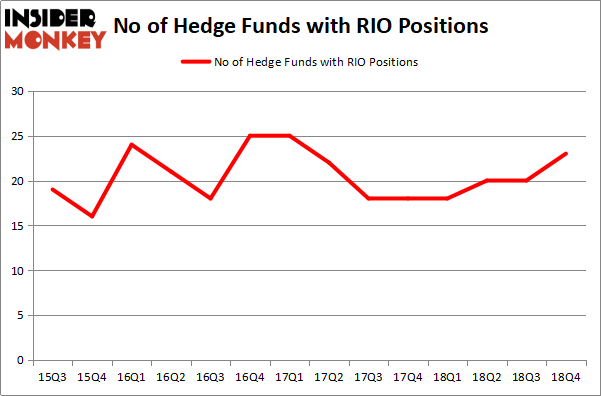 Our calculations also showed that RIO isn’t among the 30 most popular stocks among hedge funds. RIO was in 23 hedge funds’ portfolios at the end of the fourth quarter of 2018. There were 20 hedge funds in our database with RIO positions at the end of the previous quarter. We’re going to check out the new hedge fund action encompassing Rio Tinto Group (NYSE:RIO). How have hedgies been trading Rio Tinto Group (NYSE:RIO)? At Q4’s end, a total of 23 of the hedge funds tracked by Insider Monkey were long this stock, a change of 15% from the second quarter of 2018. On the other hand, there were a total of 18 hedge funds with a bullish position in RIO a year ago. With hedgies’ capital changing hands, there exists a select group of notable hedge fund managers who were boosting their stakes meaningfully (or already accumulated large positions). 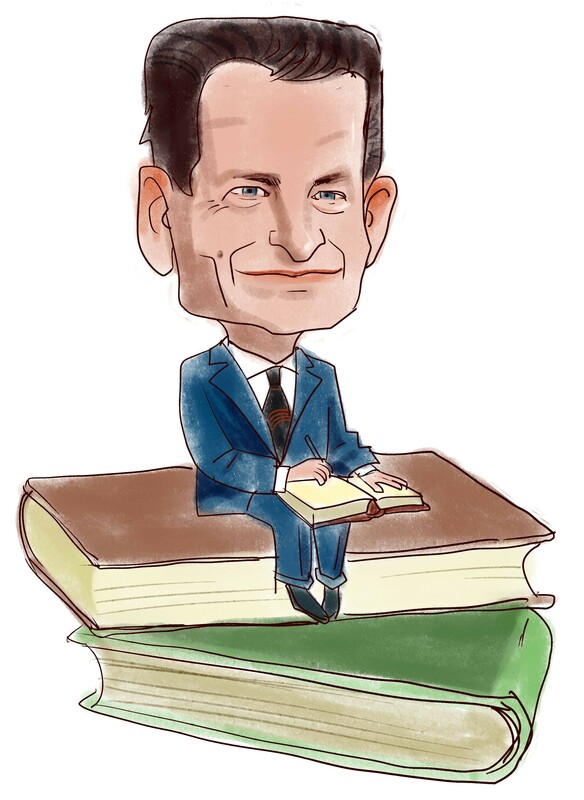 Of the funds tracked by Insider Monkey, Fisher Asset Management, managed by Ken Fisher, holds the largest position in Rio Tinto Group (NYSE:RIO). Fisher Asset Management has a $459.9 million position in the stock, comprising 0.6% of its 13F portfolio. The second most bullish fund manager is Arrowstreet Capital, led by Peter Rathjens, Bruce Clarke and John Campbell, holding a $307.6 million position; the fund has 0.8% of its 13F portfolio invested in the stock. Other peers with similar optimism include Robert Bishop’s Impala Asset Management, John Overdeck and David Siegel’s Two Sigma Advisors and Jacob Doft’s Highline Capital Management. Consequently, some big names were leading the bulls’ herd. Highline Capital Management, managed by Jacob Doft, assembled the biggest position in Rio Tinto Group (NYSE:RIO). Highline Capital Management had $32.1 million invested in the company at the end of the quarter. Ken Griffin’s Citadel Investment Group also made a $30.6 million investment in the stock during the quarter. The following funds were also among the new RIO investors: D. E. Shaw’s D E Shaw, Lee Ainslie’s Maverick Capital, and Sara Nainzadeh’s Centenus Global Management. Let’s now take a look at hedge fund activity in other stocks – not necessarily in the same industry as Rio Tinto Group (NYSE:RIO) but similarly valued. These stocks are NVIDIA Corporation (NASDAQ:NVDA), American Express Company (NYSE:AXP), Gilead Sciences, Inc. (NASDAQ:GILD), and Starbucks Corporation (NASDAQ:SBUX). This group of stocks’ market values match RIO’s market value. As you can see these stocks had an average of 47.5 hedge funds with bullish positions and the average amount invested in these stocks was $6196 million. That figure was $1143 million in RIO’s case. Gilead Sciences, Inc. (NASDAQ:GILD) is the most popular stock in this table. On the other hand NVIDIA Corporation (NASDAQ:NVDA) is the least popular one with only 41 bullish hedge fund positions. Compared to these stocks Rio Tinto Group (NYSE:RIO) is even less popular than NVDA, however the hedge fund sentiment started to improve in December as some hedge funds saw an opportunity to snap up cheap shares. Our calculations showed that top 15 most popular stocks among hedge funds returned 19.7% through March 15th and outperformed the S&P 500 ETF (SPY) by 6.6 percentage points. Hedge funds were also right about betting on RIO as the stock returned 24.4% and outperformed the market as well. Hedge Funds Have Never Been This Bullish On Thermo Fisher Scientific Inc. (... Do Hedge Funds Love Diageo plc (DEO)? Itau Unibanco Holding SA (ITUB): Are Hedge Funds Right About This Stock? Were Hedge Funds Right About Dumping Twenty-First Century Fox Inc (FOX)? Were Hedge Funds Right About Buying United Technologies Corporation (UTX)? Were Hedge Funds Right About Buying Costco Wholesale Corporation (COST)?